Hi everyone, Spartan here with Site Poll 94. Last week we talked about your favourite Captain/Shipmaster. Many honourable men were mentioned, but the clear favourite was Captain Jacob Keyes, and for good reason. Click here to view the last poll, 93. Which Spartan-IV do you like most? Now the truth is, most of us admire the Spartan-IIs and IIIs over the IVs. This is because they have more history, and in most cases a rougher background. Most of them have more experience, because they've been fighting for longer, and that leads most of us to respect them more. Thing is, that last statement about more experience isn't necessarily true. Many Spartan-IVs were previously ODSTs or ONI agents, and also have plenty of experience. The Spartan-IVs aren't respected/appreciated enough, at least this used to be the case a few years back. I was also pretty prejudice against them, mostly because of their lack of discipline compared to the IIs and some IIIs. Thing is, the IIs aren't all that disciplined killing-machines themselves to be honest, John-117 depicts them that way though. They can be talkative (some more than others) and speak casually with each other. They just do this a lot less than the IVs do, due to their background. I learned to appreciate all of the IVs (apart from a few, Scruggs for example), and they deserve as much respect as the IIs and IIIs. Keep in mind at least one Spartan-II also went turncoat, don't think any IIIs did though. The Spartan-IVs are generally more expressive and slightly less disciplined compared to the IIs and IIIs, for the reasons mentioned above, but they're great soldiers nevertheless. Considering the IIs and IIIs get most attention, which is understandable, I'd like to focus things on the IVs this time. Which Spartan-IV do you like most, and why? This is really tough because they've introduced some fantastic characters in the extended universe. It's hard not to go with one of the studs on Fireteam Osiris but my favorite Spartan IV is a clear fan favorite - Gabriel Thorne. We saw so much development of his character through Spartan Ops and Escalation it's hard to not feel stronger for him than the other Spartans. He's every characteristic of a good soldier which is a wonderful setup for him to possibly make some questionable decisions against ONI in the future (he's already questioning some of the things they've done). I'd love to see some more Fireteam Majestic in the future. Truth told, I'm not really that fond of any of the Spartan-IVs. I'm sure a lot of that is down to not having read any of the books since Halo 4, but the ones in the games just aren't really that interesting. The only ones I can really name are Palmer, Thorne, and the members of Osiris. Palmer is pretty dull, and it doesn't help that she's so overpowered in cutscenes: the same applies to Osiris, who seem to make up for their general lack of personalities by showing off in the intro. The only two members of Osiris who really get any development at all are Locke and Buck. In the case of Locke, Nightfall was pretty unimpressive to begin with, and in Halo 5, he's as poorly written as everyone else. Buck has the advantage of having been in ODST, but again, come Halo 5 and he's a completely different character, reduced to wisecracking instead of actually showing off any trace of his personality in ODST. That only really leaves Thorne, and while he's certainly nice enough in a bland, 'designated hero' kind of way, he just doesn't really get enough screen time, or character development, for me to be invested in him as a character. Thorne is the only answer. Edited by Twinreaper, 04 October 2018 - 10:47 PM. You realise Halsey was a monster, and became psychologically unstable towards the end of the Human-Covenant War? She's a 26th century Mengele, though maybe a little less intense. 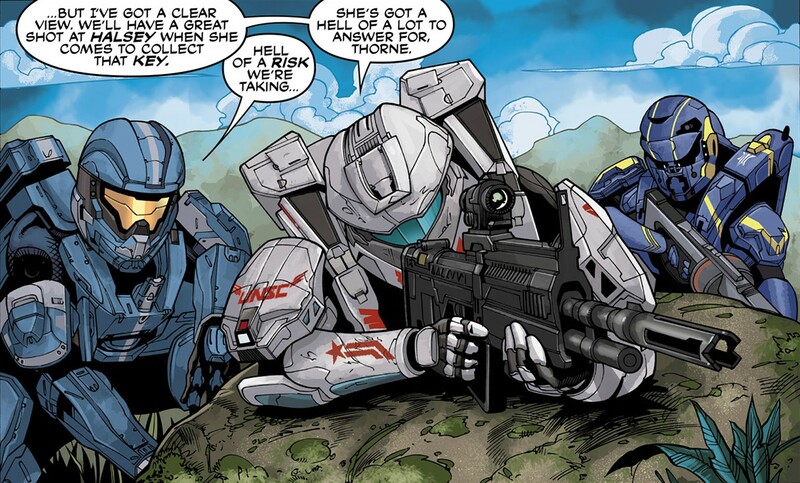 Whether she's regained her stability by 2558/2559 or not is irrelevant, she was never a hero when it came to Spartans. She's done many great things for humanity, and yes the Spartans were vital, but she can't be justified for what she did to create them. Ethically, the Spartan-IIs should never have been made, no matter how useful they ended up being. She wouldn't sort out the Spartan-IVs, the Spartan-IVs are the way it should have been from the start, with consenting individuals who wouldn't have their quality of life affected against their will. Unfortunately biochemistry at the time wasn't as good as it was around 40 years later. As for your answer, I'm afraid it doesn't qualify for the poll.